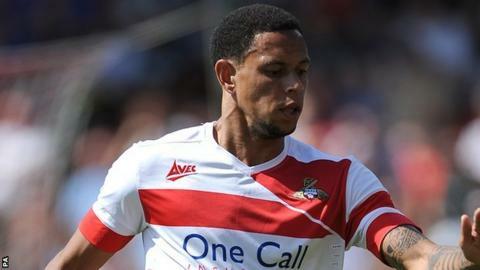 Nathan Tyson scored a brace as Doncaster twice came from behind to claim a point at Coventry. Adam Armstrong coolly slotted into the bottom left corner to open the scoring for the League One leaders. Sky Blues keeper Reice Charles-Cook could not hold Andy Williams' shot as Tyson pounced to equalise for Rovers. The hosts' lead was restored when John Fleck rifled in a low 25-yard shot, before Tyson intercepted a pass and curled in for a second equaliser. "We're a very frustrated dressing room. These days come along, I've tried to warn everyone about them. "We didn't lose, but the nature of the goals we conceded was very disappointing. "We had lots of good play and plenty of opportunities to put the game to bed. I think we did enough to get the three points. We have a little break now and get ready for the next game." Match ends, Coventry City 2, Doncaster Rovers 2. Second Half ends, Coventry City 2, Doncaster Rovers 2. Nathan Tyson (Doncaster Rovers) is shown the yellow card for a bad foul. John Fleck (Coventry City) wins a free kick on the right wing. Harry Middleton (Doncaster Rovers) is shown the yellow card for a bad foul. Nathan Tyson (Doncaster Rovers) hits the bar with a right footed shot from outside the box. Attempt missed. Adam Armstrong (Coventry City) right footed shot from outside the box misses to the left. Substitution, Doncaster Rovers. Cameron Stewart replaces Andy Williams. Corner, Coventry City. Conceded by Luke McCullough. Attempt saved. Andy Williams (Doncaster Rovers) right footed shot from the right side of the box is saved in the centre of the goal. Attempt missed. Ryan Kent (Coventry City) left footed shot from outside the box is close, but misses to the left. Hand ball by James Coppinger (Doncaster Rovers). Goal! Coventry City 2, Doncaster Rovers 2. Nathan Tyson (Doncaster Rovers) left footed shot from a difficult angle on the left to the centre of the goal. Andy Williams (Doncaster Rovers) is shown the yellow card for a bad foul. (Coventry City) wins a free kick in the defensive half. Attempt blocked. Craig Alcock (Doncaster Rovers) right footed shot from outside the box is blocked. Attempt blocked. Harry Middleton (Doncaster Rovers) right footed shot from outside the box is blocked. Corner, Doncaster Rovers. Conceded by Jim O'Brien. Attempt missed. Jim O'Brien (Coventry City) right footed shot from outside the box is close, but misses to the right. Attempt missed. Adam Armstrong (Coventry City) left footed shot from outside the box is close, but misses to the right. Corner, Doncaster Rovers. Conceded by Ben Turner. Conor Grant (Doncaster Rovers) is shown the yellow card for a bad foul. Ryan Kent (Coventry City) wins a free kick on the left wing. Corner, Doncaster Rovers. Conceded by Romain Vincelot. Goal! Coventry City 2, Doncaster Rovers 1. John Fleck (Coventry City) left footed shot from the centre of the box to the top right corner. Corner, Coventry City. Conceded by Thorsten Stuckmann.